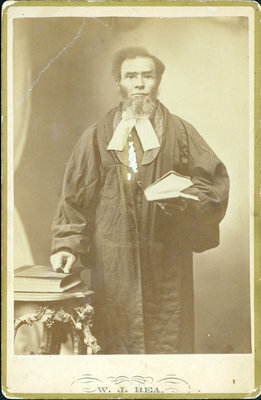 An unidentified African Canadian man is featured in this cabinet card by W. J. Rea, photographer, of Windsor, Ontario. The man appears to be in official dress, possibly of a religious or legal nature. This cabinet card bears the stamp of the photographer, W. J. Rea, in black ink along the bottom of the card and on the reverse. While it is undated, it is likely from the 1870s or 1880s. This cabinet card was in the possession of Iris Sloman Bell, of St. Catharines, Ontario. The Sloman - Bell family descendants include African American slaves from the United States who settled in Canada. "Cabinet card photographs were first introduced in 1866. They were initially employed for landscapes rather than portraitures. Cabinet cards replaced Carte de visite photographs as the popular mode of photography. Cabinet cards became the standard for photographic portraits in 1870. Cabinet cards experienced their peak in popularity in the 1880′s. Cabinet cards were still being produced in the United States until the early 1900′s and continued to be produced in Europe even longer. The best way to describe a cabinet card is that it is a thin photograph that is mounted on a card that measures 4 1/4″ by 6 1/2″. Cabinet cards frequently have artistic logos and information on the bottom or the reverse of the card which advertised the photographer or the photography studio’s services."